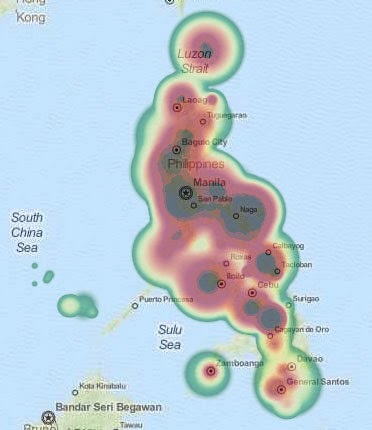 Why is there a need to map the Philippines? Mapping the Philippines must be done due to its unlimited benefits. It can be used for social, recreational, humanitarian, navigational, informational, and disaster risk management. For an average Juan Dela Cruz, digital maps are used by social networks so netizens can check-in or find establishments in Foursquare, Google Maps/Latitude, Facebook, geo-tagged Twits, and many more. Yet with its more important use, it can be used for navigation. A few years back, you only see GPS-guided navigation on cars in movies yet now, these are mostly available to all gadgets such as your smartphone and geo-tagged cameras. Travelers, mountaineers, adventurers, and sports enthusiasts require maps for so many purposes. Government and even non-government organizations use digital maps for their disaster risk management strategies and humanitarian missions where topography and logistics are involved. In the future, these same maps can be used for auto-pilot of cars using mapping data, GPS, and sensors. To sum up, a precise mapping data must be available and the Philippines is just getting there. Schadow1 Expeditions is an advocacy in mapping the Philippines, hence, the site owner is an active contributor to three mapping consortia in the Philippines since 2005: namely OpenStreetMap Philippines, Roadguide Philippines and Google Mapmaker. As mentioned in our tagline, our advocacy is to ensure that every Filipino would not be a stranger to his own motherland and therefore everyone is entitled to access free information regarding the Philippines, especially its road networks. 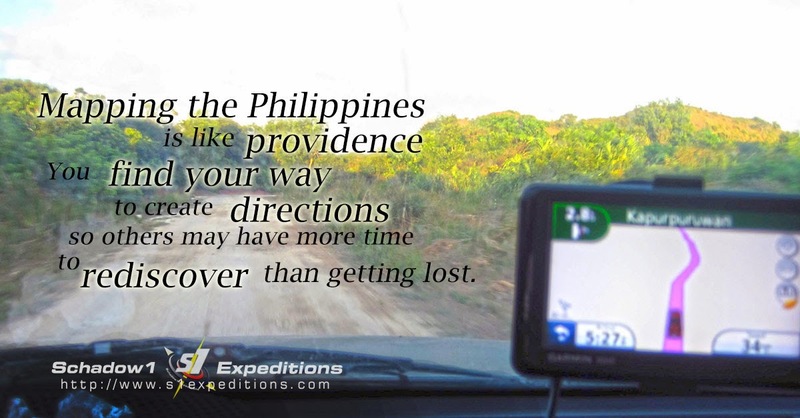 RoadGuide Philippines is an organization of people mapping the country where the contributions are provided to its active contributors free of charge, which can be loaded to Garmin GPS devices for navigation assistance. OSMPH for short is an organization of people mapping the country where the data collected from the contributions are used for various purposes and for free as long as it agrees with the OpenStreetMap policy. An example is the maps used by Foursquare. Government institutions are also piggy-backing with the data obtained from this consortium for government and humanitarian purposes. Contributions are published in realtime. Additionally, a friend and a co-mapper, Maning Sambale has initiated on compiling the OpenStreetMap data for the Philippines and is exported for use on Garmin GPS devices for navigation assistance. Currently, our blog is continuing the compile process and enhancements to which is downloadable for free and is updated at most twice a week. Slides presented by Schadow1 Expeditions during its mapping talks. 360-degree images contributed in Mapillary as assistance for open-source and crowd-sourced street-level accurate mapping. If you would like to support our mapping costs and would like to donate, you may do so by clicking HERE. Donations would help by assisting us in our travel and gadgets costs for mapping the country. The proceeds would also help us in maintaining and operating our server and compiler cost to continuously supply the latest GPS routable map of the Philippines. For the list of donors, you may refer to our donation page. Aside from the GPS map we compile for Garmin devices, the mapping data we contribute to reflects on other GPS navigation software that uses Openstreetmap data including those in OSMAnd and MapsMe. For information on other navigation assistance products that uses OSM data where Schadow1 Expeditions contributes, see those that are for Android, Windows Mobile, Apple IOS. Wondering where we map and the localities that benefit from our mapping expeditions? Here's is Schadow1 Expeditions' Mapping Advocacy Heatmap. Some of our Mapping Expeditions in the Philippines over the years where our contributions are presented via OpenStreetMap Cycle Map rendering below. For a concerted communication on all mapping advocates of the Philippines, please use the hashtag #mapPHL. #mapPHL is a hashtag call to unify mapping advocates of the Philippines not limited to any platform they contribute to. We are encouraging mappers of Roaguide Philippines, Wikimapia, Waze and Openstreetmap Philippines to use this hashtag in addition to what you are presently using for each of your mapping consortium for collaboration and information purposes among the Filipino Mapping Advocates. This is with an objective to ensure that a Filipino must not be a stranger to his own motherland. I definitely appreciated your effort to post the most updated maps from OSM. But it will more nicer if the version history is also updated. Overall, thank you so much for the trustworthy maps! Hi Anthony. It is updated. The version history tells the revisions in map generation and not the map itself. The map however gets updated frequently as we extract the data coming from OSM. I cannot view the POI using Garmin 52LM. Could you please teach me how? Can you post the password for the contour map a little more unambigously. I tried different variations of the URL, but couldn't open it. Thanks for your a great job on the maps! Thank you very much for the effort that you put into the OSM maps. I'm having a problem with the latest version in that it refuses to route through the Kaybiang tunnel when doing an auto-route from Manila to Nasugbu. It looks as if there is a restriction on Governor's Drive just before Puerto Azul Road that auto-route refuses to go through. Thanks for reporting. Upon checking, the issue was due to an incorrect map edit at the Puerto Azul intersection in OSM. I have fixed the issue and this should be resolved on the next map compile of Schadow1 Expeditions. To be able to know if the issue is from our Garmin map or from Openstreetmap data, use OSRM http://map.project-osrm.org/ and check if routing is working as it should. If not, report the issue at OSM-talkph at talk-ph@openstreetmap.org. If it routes correctly at OSRM but does not on our Garmin maps, you can contact me directly. Travel safe! @Raffy, try this PASSWORD: www.s1expeditions.com. i also have the same problem before but this password work. Hi, I really appreciate all the efforts put in for this noble cause. I tried to download the latest Garmin map and noted that it is now password protected. Please advise how I can obtain the password. I am sure a lot of people will also be interested to know. Hi, you can find the password below the download link, it changes every update though. Cheers! Welcome! This page has the resources for you to check out and know how to utilize the maps. Travel itineraries and articles are also available. Enjoy the site! Hi! first of all thanks for the consistent map update. I have a question, though. I own a generic 5" gps unit with garmin mobile xt software installed. Everything is fine with the unit ,however, when I enter view map mode, about 3/4 of the leftmost side of the map is cut off and is displayed on the 3/4 rightmost part of the map. Its like there seems to be a scaling problem with the map but i'm not quite sure. My gmapbmap.img version is the one dated 3/24/2011. I tried looking for an updated philippine base map but can't find any. do you have an idea what could be the problem? I'm ok using it as it is but it would be better if I could find a fix for it. thank you very much. Nice job man ! It is possible to add JCV ? Really appreciate this site and the technical team. Successfully updates map of my Garmin nuvi 215. Please update more new roads in Sta. Rosa, Laguna. My place in Garden villas 3 with SM savemore inside not yet seen in map - was developed 2 years ago. Thank you very much guys! It seems that the northern part of Palawan in the July 3 version has no roads. I checked it in the openstreetmaps.org and it is updated. I always use Garmin on my Nokia phone and I found your page very helpful in updating the map. Thank you very much. Tried installing the latest map to my garmin 2460 using base camp but had some issues on some parts of the maps as it only shows a blank white page. Any ideas what might have caused this? This is a known issue with Nuvi 24xx 25xx models since 2010. Some map tiles are missing on different zoom levels although data is still there. Until now, I could not find a solution. Use mapinstall for installing the map.. I just got my Garmin from US. A compatible Garmin GPS device. Windows XP SP1 and above. My problem is I don't know where the map source is in this page and I am not familiar with the file extensions for maps. Please direct me to the download page it is very much appreciated. i cant open the zip file. what's the password? Same problem. What's the password for the osmph_img_lates.rar file? hi to all , do i need to use 7 zip to convert the downloaded disc image file before i can use it ? If you are pertaining to the gmapsupp.img version. This is a standalone map. All you need to do is to copy the img file directly to the maps folder of your Garmin device. i can view it now on my garmin unit , Thank you . how about on the pc , i had installed the map source but can't make the downloaded file to work or be viewable ? sir ervin , i mean the win mapsource file does work . sir ervin, nagdownload po ako ng basecamp, installed it. tapos ngdownload ako ng map installer for garmin. ok naman po yung process. pero nung ginamit ko kanina yung garmin ko, starting from my home, d naman na nya sinusunod yung mismong path ng kalsada po, bale gumawa sha ng sariling (highlighted in pink) way po. lumihis sha sa kalsada. tapos hindi po gumana yung rerouting nya. ano po kaya naging mali ko sa pag install po? nag update ako ng map kc lagi lumalabas sa garmin ko na outdated na daw yung map ko. follow up po sa unang comment ko po, bale hindi po nya sinusunod yung mismong kalsada. wala po sha kurbada, kahit nasa kurbadang kalsada ako. puro straight line po yung highlighted path nya. Sir question regarding street search in Garmin OSM. How come walang result pag mag search/find using OSM pero pag mag switch to Garmin City Navigator map may result nakukuha? May extra file ba needed to have OSM search/find capable? where can i get the PW? Hi. I'm trying to download your latest map but nothings working from copy.com at the moment. Tried map installers and the gmapsupp file. Is there an alternative download server available? Hi, I just downloaded you latest compressed gmapsupp file and successfully extracted it using the password. Now I have another compressed img file named gmapsupp which Winzip and 7Zip are unable to open. Do I just copy this compressed file to the Garmin Root of my GPS SD Card or is there another process to obtain and use the map? It depends on the GPS device. Sometimes it should be copied to root, sometimes inside the garmin folder. And when another gmapsupp.img exists, you can either overwrite it to have this PH map you obtained from this site or rename it to another name such as gmapsup2.img so they may co-exist but then you need to disable one via the device as only 1 routable map of a country at a time can be enabled. But gain, it depends on the GPS device as some does not have the same naming convention. The best way so far is use Garmin Basecamp to manage the maps and download the map installer for mapsource and use my guide also written above. Many thanks Ervin, but my issue is that I have downloaded the compressed file gsmapsupp and extracted it using the password, only to find another compresssed file named gsmappsupp inside. I cannot open this file with winzip or any other, so what do exactly do I do to get it into uncompressed gsmapsupp.img status to copy to the GPS using your guide with Basecamp etc? Or do I just use it as it is in its compressed form ? Is this compatible with the Nuvi 65LM? You may check out this list for compatibility. Although your device is not yet added on the list. More likely it will work but please let me know how it went through so I can add this device on the tested compatible list. sir ervin, where is the password? Hi. I can'r download the update. Your cloudstorage says you exceeded bandwidth for your account. Apologies, but you have to wait for a few hours so it will refresh. We currently have a lot of download traffic and we don't have funding for a server for a larger bandwidth. Thank you for understanding. Just would like to say thank you for providing the best map for the Philippines. I hope this can be used as a basemap for Waze so that aside from being a complete map, it can also help us ply alternate routes during traffic jams. No issues here. You have a corrupted download If you are trying to download the July 19 2015 winmapsource version, the file size must be 66.9MB. Try to delete the file. Clear your browser's cache or use a different browser then re-download it again. I downloaded osmph_winmapsource_latest.zip and it requires a password to extract? Used your map for the first time to get to Barangay Ramirez for a Mt. Marami climb. I was surprised it does not only have a map to Ramirez but trail maps too. We didn't hire any guides anymore and used this map instead to reach Silyang Bato. Thanks for this! How do I properly install the "Elevation Contour Map of the Philippines v20150131" in Basecamp? I have installed it but clicking on the tab map>ElevContour Philippines, there was nothing. How do I use this "Elevation Contour Map of the Philippines v20150131"? The first installation process you've done is supposed to be the straightforward and easiest. It is possible the Detail Level is set to lowest or your view is on a different country that is why there is no data. Let me know via email if this worked for you so we can troubleshoot as you were the first to have this issue. Is the format .img compatible w qgis sir? Cant seem to make it work if it does. it says "The program ca't start because qgis_core.dl is missing from your computer. Try rein+stalling the program to fix the problem." Reinstalled it already w same error. thanks! Hi Ervin, I am getting problem on this version of your map, I try to route point A to B, and the result was a straight line, using Basecamp, but in Mapsource there was no issue, I rty to recalculate the selected route but no luck. Using another OSM map (http://garmin.openstreetmap.nl/) at walang issue. It also works well with Garmin devices except on Basecamp. It is a known issue that I've seen when I considered routing information for heavy vehicles coming from OSM data which unfortunately could not be handled well by Basecamp. It was a trade-off I considered to ensure proper routing algorithms on more recent devices as after all, the Garmin map is used more on its devices than on PC. Although the workaround for this on Basecamp is to select Motorcycling routing profile and customize to allow passing on Toll roads. This will mimic the Driving routing profile without the routing problem. Let me know if this helps. Thanks a lot for revising the routing to Eagle Ridge. I tested it today and it is just what I had hoped for, not for me but for others who might use a Garmin GPS to reach Eagle Ridge Golf and Country Club. Again, many thanks. hi sir accidentally erase the data of my garmin 255w nawala po yung map. pano po ibalik. thanks. Hi. Is asking for Junction View too much to ask? Garmin user here :) Love your work! got it sir thanks alot!!! I have recently released an update (01-27-2016). Do check out if it works for you. If not, try to test route on the OpenStreetMap website. If the result is the same, please report at the OpenStreetMap Philippines FB page. hi bro, ask ko lang kung pano install yung contour map? mas helpful kase yun sa work ko. thanks more power! The same on how to install the routable map. Kudos to sir Ervin!and to all the mappers! Thanks for this update sir, but I cannot download it because it is password encrypted.. Can you please post the password for this. Thanks again! You may have been already able to download the file but you cannot extract it because it is password protected. Password is automatically downloaded when you load this page as version.html. Password data is written in that file. sir what's the password for the Map Installer for Garmin Mapsource/Basecamp 2016-Nov-09? Sir can you update the connection of two streets in BF Homes Homes Phase 3 Deparo Caloocan City. Morning Glory street and Gladiola street are connected. Just made the changes. Would reflect in our maps next week. You are welcome sir. Your efforts there in Davao is commendable. Mabuhay po tayo na involved sa bolunterismo. I used to download the map for free. Now I noticed it's no longer free. True, the "free" one is just version 1.24, while the "better" one is version 3.11 or later. Oh well, that's the end of it.